Twelve years into the 21st Century, most members of Western society would agree that new technologies have changed their lives immensely. Through technological devices like smartphones and computers, as well as social network platforms like Facebook, YouTube and Twitter, citizens of the 21st Century are increasingly extending their lives beyond their local communities. These technological devices and platforms allow anyone with access to an Internet connection to participate in a digitized global community. It’s fair to say that today, technologically savvy citizens have at least two lives – their physical reality and their digital, online persona. While these can be one-in-the-same or consist of several different digital avatars, members of our global, digital community have the ability to be both consumers and producers of mass media. Although scholars have extensively studied emerging technologies themselves, not much has been written about the films and videos that have emerged from and are exhibited on new media. With China on Video, Paola Voci, senior lecturer at the University of Otago, New Zealand, attempts to fill this gap and develop a framework for scholars to utilize when decoding works created on new media. Using China as a case study, Voci’s insightful book acknowledges the social, political and cultural significance that new digital media and social networks have within the strict confines of the Chinese government. However, she points out her book is not necessarily an examination into these important concepts. Instead, China on Video is a useful survey of a number of less visible films and videos that have been created and distributed through these new technologies. 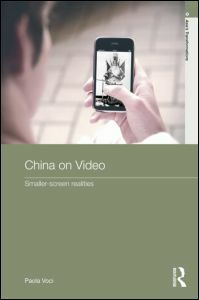 Drawing primarily from cinema studies and cultural studies, Voci looks to ‘smaller-screen realities’ as a way to not only understand how Chinese citizens are expressing themselves publicly within an alienating and at times claustrophobic culture, but she is also challenging scholars to understand and take notice of new kinds of cultural products. In her book, Voci examines smaller-screen realities or innovative movies that are not directly connected to cinema – works that have received little to no critical attention such as “cell phone movies, music videos, short animations, online amateur documentary” (3). Although some scholars may dismiss the validity of these movies because of their amateurish quality or inaccessibility in terms of content or distribution, Voci believes that these works are important. While they may be classified as un-popular or films that have a very limited audience because of their content or distribution, collectively smaller-screen realities are changing the media environment in China and the entire world through their “genre-defying, category-resistant, media-crossing experience” (4). Using a number of seminal essays by Rudolf Arnheim, Tom Gunning, Siegfried Kracauer, Miriam Hansen and others, Voci connects emerging smaller-screen realities to notions of what constitutes as cinema. Voci defends her study, stating, smaller-screen realities “should be framed in the larger history of the moving image to which both film and video or silver screens and smaller screens belong, but within which they have developed differently” (12). In a world where millions of hours of videos are being captured via smartphones and posted to Internet sharing sites, it is impossible to ignore this emerging cultural force. While many of these works may be home movies or inaccessible, uncontextualized video fragments, it is impossible to deny that the creation and sharing of smaller screen movies fulfills a cultural need. Like cinema, smaller-screen movies are technologically mediated expressive and cognitive acts of vision which connect with, and affect, the individual and public spaces. These diverse visual practices, rather than being mediated by technology and experienced collectively, all reappropriate the mediate technology via individual and even individualistic transformative gazes. As a result, the moving image can be disassociated from the public spaces that it has mostly inhabited since its early developments – namely silver-screen movie theaters – and is moved to more privately defined spaces (185). For Voci, smaller-screen realities include a number of different kinds of works, the largest being documentaries. These nonfiction works range from being traditional, small-scale productions (i.e. created by one person) to more unconventional films created by and about subaltern subjects/communities – such as Wu Wenguang’s 2006 collection of short films made by Chinese villagers or Ou Ning’s Meishi Street (China, 2006). In addition to these projects, Voci also examines what she calls light political documentaries or works that are “constructed, circulated, and interpreted as having a political perspective” even though they are not overtly didactic and lack many signifiers of what constitutes as a documentary (129). A simplified explanation of this kind of video would be like raw footage of a newsworthy event. Besides nonfiction works, Voci analyzes more unconventional and less accessible films, such as light animations and Eago (comedic) movies. She also provides a thoughtful analysis of Cellflix or DIY videos – a self-reflective form of microcinema where the running time, file size and aesthetic qualities has been “condensed and shrunk not only to fit the smaller screen” of a cell phone or personal digital media player (77). Yet, regardless of what kind of film she is analyzing, Voci notes that often these works are “concern[ed] with preservation of individual identities, detached from groupings and social categorizations, and the exploration of their ability to reach out to others and connect” (76). Smaller-screen realities are works that are more individualized in terms of their scope, production and viewing experience. In addition to these kinds of cultural products, one particularly insightful section of China on Video, delves into the individualized experience of connecting with larger groups online, giving brief, but thoughtful commentary on digital communities like the online virtual world, Second Life. I borrow and adapt the notion of lightness from Milan Kundera’s association between the multiplicity of insignificant events and their deep (and in Kundera’s terms, ‘unbearable’) meaning in defining human existence. By describing smaller-screen movies, movie-making, and viewing as light realities, I want to point to their ‘insignificant’ weight in terms of production costs, distribution size, profit gains, intellectual or artistic ambitions, but also their deep meaning in defining an alternative way of seeing and understanding the world (13). It is through this concept of ‘lightness’ that Voci’s book successfully pushes its readers to rethink the traditional boundaries of what constitutes as cinema. Even though she is analyzing a number of cultural works that may not necessarily be significant globally or even nationally, Voci uses ‘lightness’ to highlight the importance of small screen production and distribution practices. Voci believes that in addition to pushing the boundaries of legitimate and popular culture, small screen films provide a way for individuals to feel connected and engaged in the complex, modern world. In Voci’s words, “Lightness is, first and foremost, a modality of expression that preserves and expands upon individuality within public spaces that are dominated by legitimate cultures…lightness therefore points to a resistance to being identified and categorized according to endorsable value systems, whether cultural, economic, or political” (188). While these light works may not be easily identifiable or recognizable to the masses, as a collective whole they have a connection to the larger popular culture and media environment in China and around the world. Useful for film, media, cultural and contemporary China studies students and scholars, China on Video is a step toward analyzing and understanding an increasingly growing number of cultural works. Voci’s text presents a fresh way of looking at how new technologies, and the cultural works that emerge from them, can be analyzed alongside more traditional media products. Engaging preexisting debates of globalization, new media, visual culture and the role of technology in the modern world, China on Video successfully challenges the boundaries of cinema and media studies. While it is impossible to sort through all of the smaller screen films and cultural products that exist in China and throughout the world, Voci’s book provides a clear framework for any scholar looking to navigate through the static of the evolving field of new media.